8 Tips for Optimizing Your YouTube Videos for Optimal Rankings and Viewership – Part I - SEO Eblog by SEO Advantage, Inc.
Before we dive into all the details, we urge you to take a moment and think about your own web usage. With connection speeds light years ahead of where they were a decade ago, most of us watch a considerable amount of video through YouTube and other outlets. The more technically savvy among us even use subscription services like Netflix or Amazon Prime to watch our favorite movies and TV shows. Considering the fact that YouTube itself garners more viewers in a month than 10 Super Bowls combined should give even the biggest skeptic pause. While you may understand the importance of including online video in your business marketing strategy, the methods for ensuring those videos are successful may be unclear. To learn how you can optimize your YouTube videos for optimal rankings and viewership, we invite you to consider this very important tip below, and to check back in a few days for 6 other things you can do to ensure its success. The first tip itself was important enough to warrant its own blog post – while it may seem elementary, a large majority of YouTube posts don’t consider this. 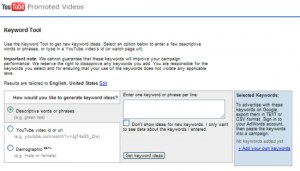 Optimizing your YouTube video content – Keywords, Keywords, Keywords!! The first point to consider is keywords. You may be thinking – “I already think about keywords all the time.” While SEO pros and web marketers spend hours researching keywords for their main website, many forget to do the same for YouTube videos. The basics are the same for a webpage, but you need to remember that the demographics of your YouTube users may differ from your general website audience. 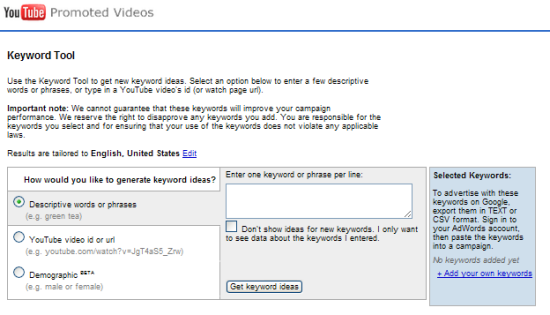 To find the right keywords, start by doing a general YouTube search. You should notice several suggestions come up on your screen. While really basic, this method will get you started, and can also provide some good long-tail suggestions. After some basic research, consider tools like YouTube’s Keyword Tool, Analytics, and of course Google’s research tools. Title – This is by far the most important field to optimize. You have up to 100 characters to work with, but the first 60 are the most important since that’s what gets displayed in search results. Be sure you get your important keywords in those first 60 characters!! Description – This gives a lot of room to work with – 5000 characters in fact. But like the title, you’ll need to make sure you include the most important keyword-based info in the first 150 characters since this is the cutoff for how your video will appear in the search results. It’s also highly recommended you include a link to your website URL in the beginning of the description. Tags – Tags are indexable, and important for ranking, but it’s easy to spam them. However, you should include your important keywords (…or alternatives) in your tags. Also include any brand names, locations, possible misspellings/typos, etc. Keywords are by far the most important, and most often overlooked element of building a strong YouTube channel and video presence. We felt it was so important that we wanted to be sure it got its own post. Continue reading Part II for 7 additional tips you can consider for optimizing your videos on YouTube. We also invite you to refresh yourself on the basics of filming an interview. While interviews are just one type of video content, they can be highly valuable sources of information if done properly.